Holy haunted dolls Batman. A guy in Alabama claims he was attacked by his girlfriend’s dolls. Phillip’s girlfriend, Nicole, has 100 dolls in her bedroom of which two evidently scratched him while he was sleeping . Nicole, who can communicate with the spirits, believes the dolls are possessed by “two man” hating women who both had murdered their partners, which is why they “acted out” on her boyfriend. She has now removed the two nasty assed dolls from her bedroom due to fears they may continue to torment him. Hmm, so what about the 98 others? Sleep with one eye open Phillip. Nicole claims she has been collecting “spirited” dolls since the age of 12 when she got her first possessed one. Some of the dolls that she buys aren’t haunted until they begin mingling with her highly spirited ones. Nicole also claims the dolls like to have a good laugh but only when she leaves the room because they don’t want to “show” in front of her. She can hear them though. Oh for the love of god, burn it. A nasty wooden puppet that supposedly tried to strangle its previous owner to death has been caught on camera moving in its sealed container. A trained psychologist, who has been investigating doll hauntings for 17 years, offered to study the puppet after the owner claimed it tried to kill him. For three months it has been in a sealed container blessed with holy water. Since she has been looking after the puppet there have been unusually unexplained knocking noises coming from the room it is in. 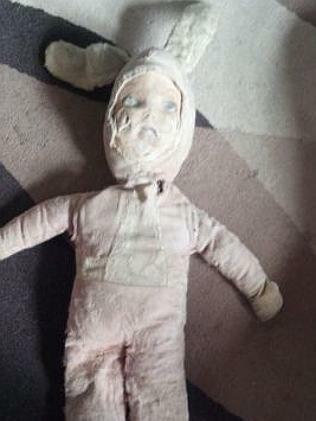 Oh for crying out loud, you don’t go and put a haunted doll on eBay UK. What the hell will happen if it finds out? From the numerous horror stories I’ve seen, that doll is gonna haunt you for eternity no matter what you do to rid yourself of its evil. Sorry sunshine. The owner, who claims the damn thing is possessed, has numerous scratches and one very tired eye from his encounters with the evil little thing. The starting price on eBay was 5 pounds but some fool has purchased it for 200. Never you mind that doll won’t be gone for long…. just saying. Move over cyber bullying we have a new winner. Some poor little 11 year old girl is sleeping with one eye open after she found her Raggedy Ann doll decapitated on her front porch with a note reading “Bella … Kill yourself or I will kill you” stuffed down its throat. Psst Friggin Ohio, home of Bearman. Want to traumatize your kid forever? How about getting them a reborn baby vampire doll? Yes, indeedy, this should put them in therapy for a couple of years. Sleep with one eye open little snowflakes or baby Elvira might get ya on the neck…boo!!! Psst You can by them at the Twisted Bean Stalk Nursery.